Radiology can play a part in controlling health care–associated infections. Contaminated equipment not only has the potential to infect patients and health care workers; it also can defile an entire field of health care. For example, earlier this year, endoscopy's reputation in the area of infection control was tainted when the FDA said it found hundreds of patients to have been exposed to or infected by contaminated endoscopes. Those exposures and infections occurred in facilities in the United States and worldwide between 2010 and 2015. This spate of health care–associated infections (HAIs) should serve as a cautionary tale to radiology professionals. Although HAIs have been on the decline, the Centers for Disease Control and Prevention (CDC) estimates that 1 in 25 hospital patients has at least one HAI on any given day. That translates to roughly 722,000 HAIs in US acute care hospitals, resulting in approximately 75,000 deaths each year. Within all aspects of radiology, taking steps to prevent the transmission of HAIs will safeguard patients and workers, as well as the field's reputation regarding infection control and safety issues. One key to infection control is good, solid communication, says Kevin Baskin, MD, chair of the Society of Interventional Radiology's VANGUARD Task Force and an interventional radiologist at Armstrong County Memorial Hospital in Kittanning, Pennsylvania, and Scott C. Goodwin, MD, FSIR, Hasso Brothers' professor and chair of the department of radiological sciences and vice president of University Physicians and Surgeons at the University of California, Irvine. "Communication is the most helpful thing in avoiding needlesticks and sharps-related injuries," Baskin says. "Being meticulous about communication and documentation with respect to sharps is pretty common sense. It's hard to regulate or legislate common sense, but you certainly can educate people's frame of mind on vigilance." IR departments also must communicate with members of the infection control department to make sure that the same safety measures being applied in the operating room (OR) are also applied to IR, Baskin emphasizes. "We treat the IR work environment like an operating room, and I think that it is difficult for others in the hospital, including those in infection control, to understand the environment that we work in," Baskin says. "They well understand the need for positive pressure ventilation in an operating room, for traffic control around those spaces and other precautions, and the different levels of cleaning needed before and after a procedure, but they don't always perceive of interventional radiology in that same framework [as the OR]. So, the same precautions may not be applied." Highlighting the need for good communication in preventing infection, researchers within the individual departments of infection control and vascular and IR at UCLA released a study in 2016 that describes how each of their departments were part of an interdisciplinary team that utilized a mandatory electronic communication tool (MECT) to decrease central line–associated bloodstream infections (CLABSIs). The study, published in the American Journal of Infection Control, "was part of an institutional drive to reduce CLABSI rates across the health system, due to an increase in CLABSIs during 2011." The study's primary goal was to decrease the premature removal rate of peripherally inserted central catheters (PICCs), while its secondary goal was to decrease PICC-associated infection rates that can occur with premature PICC removal. "The primary study end point was a 50% decrease in the premature PICC rate from baseline and a 25% decrease in complications and costs related to decreased premature PICC removal," the researchers state. A CLABSI was considered a complication. To conduct the study, quality and cost measurements for 200 PICCs postinstitution of a MECT were compared with 200 PICCs 12 months prior. PICC removal and complication rates were compared for the two cohorts. "Our historical cohort study demonstrates that the facilitation of early interdisciplinary communication and specialty evaluation, through innovative methods such as MECT and paging, can increase clinical quality and result in zero provider-led premature PICC removals and zero CLABSI," note the researchers, who listed IR among the study's stakeholders. Another key to infection control is compliance with guidelines. Societies within each modality encourage compliance to the guidelines they provide, yet compliance should also improve due to action taken by regulatory bodies. "The Joint Commission and CMS [Centers for Medicare & Medicaid Services] are now shining a fairly bright light on compliance and quality standards and are attaching financial incentives or penalties to certain kinds of outcomes, so I think people are starting to pay more attention," Goodwin says. CMS is conducting a pilot infection control survey project that it says will test new surveyor tools and processes in nursing homes, hospitals, and during transitions of care. "We will develop new surveyor tools based on proposed regulations, therefore these surveys will be 'educational' surveys that will not result in citations for deficiencies. The pilot will assess facility infection prevention programs in ways that focus on the most common health care–acquired infections and methods to prevent their transmission," it notes. CMS says it has surveyor infection control worksheets that facilities can use as self-assessment tools to gauge whether their infection control programs will meet the minimum health and safety standards in the regulations. "Infection prevention gaps identified and addressed by facilities should decrease HAIs and improve patient safety. Performing this self-assessment will increase the facility's chance of an uneventful survey of their infection control and prevention program," CMS adds. "Surveyors currently may visit radiology departments to assess infection control and prevention as a part of a routine survey or a complaint investigation," CMS says. "The surveyors will observe infection control elements such as injection safety, hand hygiene, environmental cleaning, and how they protect staff and other patients from infections of patients on isolation precautions. Radiology departments must have knowledge of, and be a part of, the infection control program of their facility." Goodwin believes there is a high rate of noncompliance within IR, which can affect health care providers as well as patients. Safety guidelines need to be more of a priority, according to a 2014 study, "Occupational Exposure to Bloodborne Pathogens in IR — Risks, Prevention, and Recommendations: A Joint Guideline of the Society of Interventional Radiology and Cardiovascular and Interventional Radiological Society of Europe," which also revealed the number of sharps-related injuries to be "severely underreported." "Assuming that the IR community underreports needle sticks and often ignores safety guidelines when intervening on a patient population heavily skewed toward [chronic hepatitis C virus, hepatitis B virus], and HIV infections, the typical IR physician faces a significantly higher risk than previously thought," the study states. The study provides an amended set of standards for bloodborne pathogens exposure reduction and postexposure prophylaxis. The FDA says professionals should refer to best practices from the different organizations within the field, a hospital's infection control department, and the device labeling for cleaning and disinfection instructions, when it comes to cleaning medical equipment. • Plan ahead and practice. • Designate a "point person"—a radiology representative should play an active role in planning for the facility and guiding the performance of imaging in a biocontainment situation. • Limit the amount of imaging to only what is truly necessary. Discussions should occur between the ordering physician and the radiologist prior to imaging. • Expose as few people as possible. Use only a few designated radiologists, technologists, or other radiology personnel with training in isolation gear. • Radiologic technologists should not need to make contact with the patient. Whenever possible, have imaging equipment operated by physicians in the isolation room with guidance from radiology personnel. The guidelines say to "generally avoid" the use of CT or MRI for these patients and that the need for IR should be "limited, if any." The use of a modified portable isolation chamber that conforms to CDC isolation requirements for imaging infectious patients using CT, MRI, and PET recently was tested in Singapore. "The isolation chamber had virtually no detectable impact on imaging, be it PET, CT, or MRI, while isolating the infectious subjects," says researcher James S. Molton, MBBS, BSc, FRACP, DTM&H. Molton is the clinical director in the division of infectious diseases and the research director in the division of advanced internal medicine at Singapore's University Medicine Cluster in the National University Health System, and an instructor at the National University of Singapore Yong Loo Lin School of Medicine. According to Molton, the chamber, called the IsoArk, represents an innovative approach to an operational challenge faced while attempting to research PET/MRI changes in tuberculosis (TB). "We could not scan infective TB patients within the first two weeks of treatment, without providing a negative pressure environment [university health and safety regulations]. To convert the whole research scanning department to negative pressure would have been prohibitively expensive," Molton explains. "So, we came up with this alternative approach. We then set out to study whether the IsoArk resulted in any clinically relevant image degradation, which it did not." For each modality, equivalent phantom examinations were performed without the isolation chamber and subsequently evaluated for image uniformity and noise. Eight participants with active pulmonary TB were examined within the isolation chamber without incident. The applicability of the IsoArk is primarily for patients on airborne isolation undergoing CT, MRI, or PET, which includes patients with TB, measles, and varicella-zoster virus, Molton says. 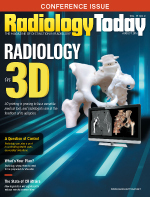 The study can be found in the March issue of Radiology. "To the best of our knowledge, no one has used this approach before. The alternative that is used in practice is the compromise arrangement of scanning infective patients at the end of the list. Our approach should, in theory, be more effective because patients are sealed in a HEPA-filtered isolation chamber, so exposure to staff should be a minimum," Molton says. "The other alternative approach—converting individual scanner rooms or the whole department to negative pressure rooms—would cost millions of dollars. Our approach is much cheaper." With a goal of producing new approaches for best practices, ultrasound professionals are being encouraged to participate in a global survey that is gathering data on infection control. The results, expected early next year, may end the debated issue of disinfecting transducers. The survey is a refinement of a pilot survey originally launched to Australasian Society for Ultrasound in Medicine (ASUM) members in order to evaluate current methods utilized within hospitals and private practices. "Results from that survey indicated a gap in the knowledge of appropriate methods for effective transducer disinfection," says Jocelyne Basseal, BSc, PhD, who worked on the refinement with Associate Professor Sue Campbell Westerway, PhD. Basseal is publications and scientific editor of the Australasian Journal of Ultrasound in Medicine, published by the ASUM, and Westerway is admin councillor at the World Federation of Ultrasound in Medicine & Biology (WFUMB). Basseal says the ASUM and WFUMB will use the results of the study, as well as the findings of a recent report, to improve their current guidelines. "That recent research study showed the prevalence of bacterial contamination within the entire ultrasound unit, including probes, transducer cords, and ultrasound gel. The results highlighted potential issues with current infection control practices, in particular inadequate sterilization by low-level disinfection and the potential for growth of bacteria in reheated ultrasound gel," Basseal notes. To date, more than 1,000 responses have been received. The survey is available at www.surveymonkey.com/r/WPMH68M. Another department that presents cleaning challenges is MRI. If the MRI suite is not cleaned well between patients, patients and staff could acquire C. difficile, methicillin-resistant Staphylococcus aureus (commonly known as MRSA), meningitis, or hepatitis, says Aimee Phillips, MS, RT(R)(M)(CV)(QM). "People assume that if no one is working in MRI that the magnet is off; the magnet is never off," Phillips says. People who go in to clean the suite under such an assumption may find equipment, such as brooms and mops, pulled into the magnet if it is not MR safe. Many MRI-safe cleaning tools are on the market and MRI cleaning services are available. Phillips recommends that the MRI staff or staffers with MR safety education perform the majority of the cleaning. However, "staff are more prone to infection from accidental needle sticks," she says. "A common route of entry for infections in MRI includes skin and venipuncture." Considering where a patient has come from and the complexity of his or her condition is key to helping prevent the spread of infection, according to Michael Chisholm, CPE, CHFM, vice president of compliance at JLL, a professional services and investment management firm that helps its health care clients maintain their equipment and space. When considering the potential for transmitting infection, departments need to consider their operations and the specific risks related to the patients they treat, he says. "Radiology departments that have procedure suites are more complex spaces that demand more complex strategies for maintenance, while general radiology departments that do not have special procedures are less complex spaces and require less complex strategies," Chisholm says. Facility design, operations, and management need to be acknowledged as part of a solid infection control plan," Chisholm says. Facility design includes the physical materials and placement of medical supplies and equipment within a care setting, facility operations include proper maintenance and cleaning of environmental equipment and medical devices, and facility management includes the effective oversight of outside contractors and services, according to a release from the company. Goodwin reiterates the need to address access issues. Speaking from his experience in IR, he says the same steps that are taken to keep the public from wandering into the hospital's OR should be taken to keep people from wandering into the IR department. Even clinicians visiting the department have the potential to bring infections in with them, he notes. "We put in new doors and a keypad control, so now every visitor has to knock if they do not know the code," Goodwin explains. "You can [also] change old surfaces out for more cleanable surfaces and/or improve ventilation control. Even in older spaces, it is absolutely worthwhile to upgrade."